For the ship Highspeed 3, see Austal. Suggested improvements in the Northern Powerhouse framework, partly labelled HS3. Northern Powerhouse Rail (NPR) previously called High Speed 3 (HS3) or Crossrail for the North is a proposed railway network in the North of England. It aims to improve transport connections between major northern English cities and transport hubs, including Liverpool, Manchester, Manchester Airport, Leeds, Bradford, Doncaster, Huddersfield, Sheffield, Newcastle, and Hull, as well as other significant economic centres. The exact route as yet has not been determined. In September 2018 the legislation for HS2 Phase 2b – from Crewe to Manchester and from Birmingham to Leeds – with the first services scheduled for 2033, has been delayed for one year to mesh in with the Northern Powerhouse Rail where applicable. The Northern Powerhouse Rail project aims to address the problem of public transport journey times between the major cities in the North of England. Present-day rail connections between cities such as Liverpool, Manchester and Leeds are slow compared to comparable journeys made by commuters across Greater London. By improving transport connections, it is proposed that commuters will be able to travel more freely to their places of work, allowing the Northern cities to compete together as one large single economy, rather than competing against one another. The Northern Powerhouse Rail scheme is promoted by the combined public transport authority Transport for the North (TfN), and according to analysis by TfN, currently fewer than 10,000 people in the North can access four or more of the north’s largest economic centres within 60 minutes. This could rise to around 1.3 million once Northern Powerhouse Rail is fully delivered. A plan to improve rail journey times in northern England, the Northern Hub or, as currently called, the Great North Rail Project, was developed from a 2009 scheme to improve the rail network around Manchester. Schemes to improve the Leeds-Manchester line speed by 2014 were included in Network Rail's CP5 improvements, with an aim to reduce Manchester-Leeds journey times by 15 minutes. In 2011, the approximately £290 million electrification of the trans-Pennine Manchester-Leeds line was given funding. Work started on the electrification in 2013, with full electrification between Manchester, Leeds and York expected by 2018. Northern Powerhouse Rail has often been referred to in the press as "High Speed 3" or "HS3", in reference to the development of high-speed rail in the United Kingdom. The first high-speed railway line to be built in Britain was High Speed 1 (HS1), the route connecting London to the Channel Tunnel, which opened 2003–2007. The southern phase of a second high-speed line named High Speed 2 (HS2), which is planned to eventually run from London to Manchester and Leeds, is currently being constructed and is estimated to come into service in 2026. The HS3 designation implies the development of a third high-speed rail route. Improvements to east-west links in the north of England have often been referred to as "HS3". This term has been used interchangeably to mean the connection between Leeds and Manchester or a longer route running from Liverpool to Hull via Manchester and Leeds. Such a railway would not necessarily need to be high-speed. [..] We refer to "east-west links" rather than "HS3" in this report as there is no clear indication yet what form or route the proposals might take or if the trains will be "high speed" in the same sense as HS2. —  The Economics of High Speed 2, Economic Affairs Committee (2015). In June 2014, at a speech given at the Manchester Museum of Science and Industry, the incumbent Chancellor of the Exchequer, George Osborne proposed a high speed rail link between Leeds and Manchester; the line would utilise the existing route between Leeds and Manchester, with additional tunnels and other infrastructure. Osborne argued that the northern cities' influence was comparatively less than London's and that the link would promote economies of agglomeration. Osborne suggested the line should be considered as part of a review of the second phase of High Speed 2. Initial estimates suggested a rail line with a 140 miles per hour (230 km/h) line speed, and Leeds-Manchester journey times reduced to 30 minutes. Osborne estimated the cost to be less per mile than that of HS2, giving a cost of under £6 billion. Initial responses to the proposal were mixed: Jeremy Acklam of the Institution of Engineering and Technology (IET) suggested that planners should look at connecting other northern cities such as Liverpool, and potentially North East England via York; commentators noted that the proposal could be viewed as an attempt to gain political support in the north of England in the run-up to the 2015 general election: the Institute of Economic Affairs characterised the proposal as a "headline grabbing vanity project designed to attract votes". The British Chambers of Commerce, Confederation of British Industry and others were cautiously positive about the proposal, but emphasised the need to deliver on existing smaller scale schemes. On 5 August 2014, an alliance of six city councils – Leeds, Liverpool, Hull, Manchester, Newcastle upon Tyne and Sheffield – unveiled an initial regional transport plan linking their cities called 'One North'. This plan incorporated a new 125 miles per hour (201 km/h) trans-Pennine high speed rail link connecting to the northern branches of HS2 at Manchester and Leeds (30min journey time), together with other regional rail developments, and the bringing forward of the construction of the northern part of HS2, as part of a regional transport plan including other road, intermodal port rail freight improvements. The estimated cost of the high-speed Manchester-Leeds rail link was circa over £5bn, with a proposed completion date of 2030; the entire project was costed at £10-15 billion. George Osborne attended the project launch, and provided his backing for the project. A report Rebalancing Britain published by High Speed Two Limited in late 2014 also acknowledged the need for improved east-west transportation links in northern England, and recommended the progressing of the schemes in the 'One North' report. On 20 March 2015, the Department of Transport published plans for transport infrastructure improvements in the north of England, including proposals by the Transport for the North (TfN) working group; the TransNorth report proposed a number of options for improved rail links between Liverpool, Manchester, Leeds, Sheffield, Newcastle and Hull with line speeds up to 140 miles per hour (230 km/h). The proposals included new-build routes between the major northern cities, with cost estimates from £5 to £19 billion, and estimated journey times of one half to two thirds of current routes; alternative upgrades of existing routes were costed in the £1 to 7 billion range, and had lesser journey time reductions, of the order of 10–15 minutes; the proposals were in addition to existing High Speed 2 route options for Liverpool and Sheffield-Leeds. The development options were planned for Network Rail Control Period 6 (2019–24). In March 2016, the newly established governmental advisory body, the National Infrastructure Commission (NIC), chaired by Lord Adonis, reported on transport infrastructure projects in the north of England. 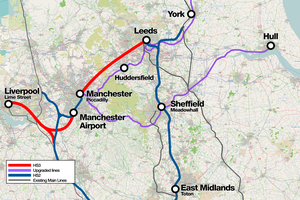 It recommended bringing forward HS3 proposals, beginning with the Manchester-Leeds section. The NIC's report, High Speed North stated that "It takes longer to get from Liverpool to Hull by train than to travel twice the distance from London to Paris". It also recommended collaboration between TfN and HS2 Ltd on the design of the northern parts of HS2; and on the design of the improved Manchester Piccadilly station, together with Manchester City Council and other rail bodies. The Report suggested the development of a HS3 link after the completion of Network Rail's £2 billion trans-Pennine electrification upgrade (scheduled to take place between 2015 and 2022, leading to 40-minute journey times). A report by Arup commissioned by the NIC studied additional improvements on the Manchester-Leeds route, focussing on the Diggle route (via Huddersfield) utilising disused track plus new-build tunnels, and identified potential journey time savings of between 1 and 10 minutes. A prelimary study by Network Rail did not rule out that the aspirational Leeds-Manchester journey time of 30 minutes could be achieved on the Calder Valley route. TfN's aspirational Manchester-Manchester Airport and Leeds-Sheffield journey times were identified as being achievable by the HS2 scheme, with modifications to through running to Sheffield city centre. At the 2016 Budget, the Chancellor of the Exchequer, George Osborne, endorsed the general proposals by the National Infrastructure Commission for a high speed line between only Manchester and Leeds, with an aim of reducing journey times to 30 minutes between the two destinations. In August 2016, the Institute of Public Policy Research urged the Government to prioritise HS3 over HS2. In August 2017, the former chancellor, George Osborne called for the Government to commit to Northern Powerhouse Rail following backing of Crossrail 2 and scrapping of electrification schemes in July 2017. Transport for the North is developing the Northern Powerhouse Rail programme and is considering how the network forms part of the existing and future rail network of the north. £60 million of funding was provided to generate plans for a route by 2017. In October 2017, the Chancellor, Philip Hammond, allocated £300 million to future-proof junctions between Northern Powerhouse Rail and HS2 to allow east-west services to use HS2 infrastructure. Later in the same month, it was proposed that an underground station for Manchester Piccadilly should be built to accommodate the new services of up to eight trains per hour; an underground station would require less building work and still provide good links to HS2. The outcome of the consultation on the draft Strategic Transport Plan should be an Outline Business Case to be submitted by the end of 2018. At Manchester Piccadilly, it is likely a new NPR station will be needed and options include a new underground station or a new surface turnback station. Between Manchester and Sheffield, TfN is currently looking at whether it can upgrade the existing line or whether a new line will be needed. A Strategic Outline Business Case for Northern Powerhouse Rail is due to be completed by the end of 2018. As well as a through station for Bradford, there have been calls for an additional station at Rochdale on the new line between Manchester and Leeds. Northern Powerhouse Rail is being developed in addition to planned improvements including the Great North Rail Project (formally the Northern Hub). HS2 Ltd and Network Rail have been commissioned by TfN to prepare engineering and costing studies on a range of rail infrastructure options. This could involve new and upgraded rail infrastructure. In addition to serving the six previously identified centres, work is also underway to develop options to serve Other Significant Economic Centres (OSECs). Options for Northern Powerhouse Rail stations will also promote and integrate with masterplans and wider spatial plans, including Leeds Station and Manchester Piccadilly. In March 2019, it was announced a new commission had been established to plan a new £6 billion city centre station in Liverpool to accommodate HS2 and Northern Powerhouse Rail Services. ^ "New report: Closer running and post-Brexit investment to transform the capacity of Britain's railways: News from Institution of Mechanical Engineers (IMECHE)". www.pandct.com. ^ "HS2 suffers setback as legislation delayed by 12 months". www.railtechnologymagazine.com. ^ "HS2: North West and Yorkshire Routes Confirmed". BBC News. 15 November 2016. Retrieved 15 November 2016. ^ "High Speed Two From Concept to Reality July 2017" (PDF). GOV.UK. Department for Transport. Retrieved 18 November 2017. ^ & Local Transport Authorities of Transport for the North 2018, p. 30. ^ a b Britton, Paul (26 October 2014). "Journey times across the north of England could be halved under multi-million pound HS3 plans". Manchester Evening News. Archived from the original on 31 July 2018. Retrieved 31 July 2018. ^ "Northern Powerhouse Rail | Transport for the North". Transport for the North. Retrieved 19 November 2017. ^ The completion and sale of High Speed 1: Department for Transport. National Audit Office/The Stationery Office. 2012. ISBN 9780102975482. Retrieved 30 July 2018. ^ High Speed 2: a review of early programme preparation, Department for Transport. National Audit Office/The Stationery Office. 2013. pp. 14–15. ISBN 9780102981421. Retrieved 30 July 2018. ^ Higgins 2014, pp. 9, 34-36. ^ Transport for the North 2015, pp. 19-21. ^ High Speed North 2016, Recommendations 5 & 6, p.9. ^ High Speed North 2016, §3.25-3.30. ^ High Speed North 2016, §3.31 - 3.32. ^ High Speed North 2016, §3.33. ^ High Speed North 2016, §3.38-3.42. ^ Budget 2016: some of the things we've announced (press release), HM Treasury, 16 March 2016, 7. HS3 between Leeds and Manchester : £60 million has been announced to develop plans to cut journey times to around 30 minutes between Leeds and Manchester, as well as improving transport connections between other cities in the north. ^ "IPPR urges government to prioritise HS3 link". 8 August 2016 – via www.bbc.co.uk. ^ "George Osborne urges HS3 rail link for Northern England". ^ Walker, Jonathan (1 October 2017). "Conservatives announce £400 million for Northern Powerhouse road and rail". ^ "Underground Northern Powerhouse Rail station proposed for Piccadilly". ^ "Northern Powerhouse Rail: Bringing our city regions closer together Emerging vision for the network" (PDF). Transport for the North. December 2017. p. 5. Archived (PDF) from the original on 31 July 2018. Retrieved 31 July 2018. ^ Local Transport Authorities of Transport for the North 2018. ^ Pidd, Helen (16 January 2018). "Four cities, 1 hour, 1.3m people: new northern rail plan revealed". The Guardian. Archived from the original on 31 July 2018. Retrieved 31 July 2018. ^ & Local Transport Authorities of Transport for the North 2018, p. 46. ^ Local Transport Authorities of Transport for the North 2018, p. 47. ^ "Council leader calls for new railway station". www.rochdaleonline.co.uk. ^ "Northern Powerhouse Rail Factsheet" (PDF). TfN. Higgins, David (October 2014), Rebalancing Britain - From HS2 towards a national transport strategy (PDF), HS2 Ltd. This page was last edited on 13 March 2019, at 15:22 (UTC).